The Sidebar: Slate reporter: Was "viral Heimlich" story a publicity stunt? 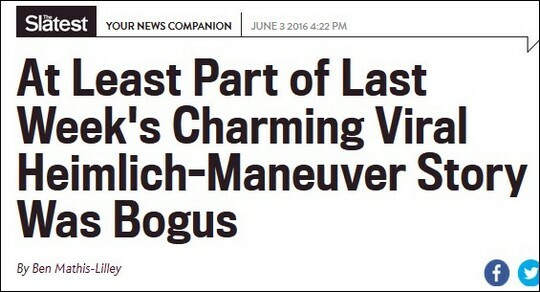 Slate reporter: Was "viral Heimlich" story a publicity stunt? 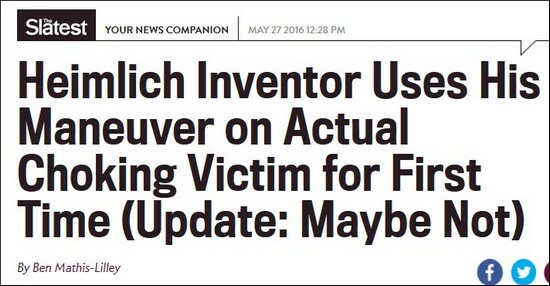 Yesterday Slate published a significant correction to reporter Ben Mathis-Lilley's May 27 story about my father rescuing a choking victim plus a new item by Mathis-Lilley questioning whether the entire tale was a publicity stunt. My Thursday corrections request to Slate (page down) apparently triggered the updates, thereby making me two for two. Per my Wednesday item, last week the Cincinnati Enquirer was badly punk'd by my 96-year-old father. On May 26, he told the paper his alleged recent application of his namesake maneuver on an 87-year-old woman was the first time he'd ever "Heimlich-ed" a choking victim. In a May 27 corrections request, I informed the Enquirer that in four published reports from 2001-2006 (including the Chicago Sun-Times, BBC, and the New Yorker), my father claimed he rescued a choking victim at a Cincinnati restaurant in 2001. This Wednesday, perhaps not coincidentally given Henry Heimlich's history as a self-promoter, was National Heimlich Maneuver Day. Both the ostensible choking victim in the recent retirement-home incident (Patty Ris) and another witness vouched that Heimlich had performed the dislodging procedure, although Ris' testimony was made public through a public relations firm rather than a direct interview with a reporter. Whatever actually happened at the retirement home, it appears that the actual final step in the Heimlich maneuver might be boondoggling the press. Per Mathis-Lilley's headline, the charming "first time" story went viral. Over the past couple of days I've filed other corrections requests and I'll report the results.